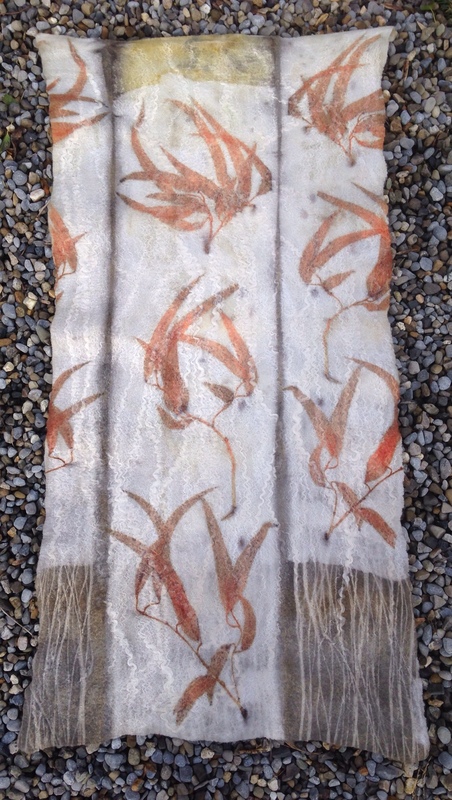 Showcase naturally printed felt wraps and silk scarves are now ready! So far today I've washed out and ironed seven felt wraps and one wall hanging, four silk scarves still remain to be done. Once they're finished my orders from Showcase will be complete, tonight I'll send the shops and galleries a Pro Forma invoice then have gift boxes, cards etc. prepared ready to dispatch as soon as I hear back from them. Hopefully these first pieces will be on their way first early next week, if it hadn't been for the bad weather and lack of electricity I would have had everything done last Friday. Here're a few of images of my latest merino, bamboo and Firestar wall hanging. I love the strength of the eucalyptus leaves, these were gathered from a tree that had been pruned, lucky me! 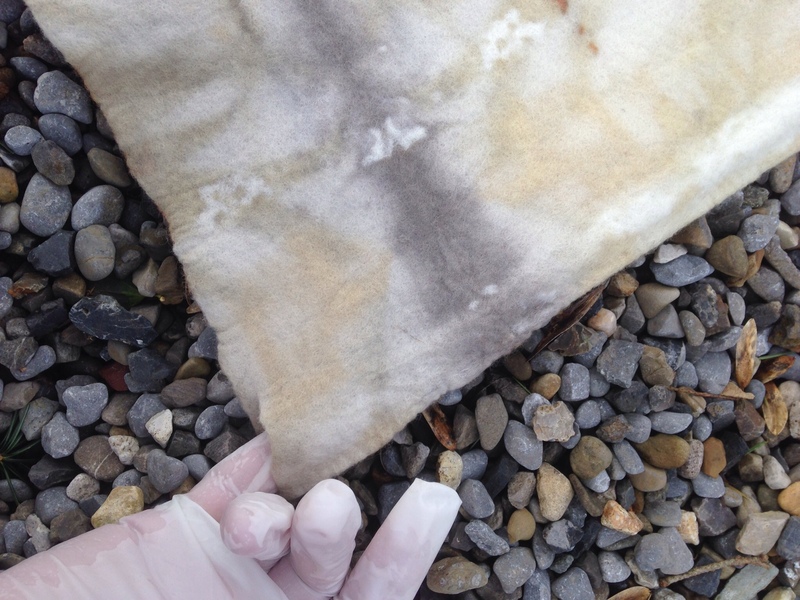 The reverse of naturally printed textiles also fascinates me, sometimes appearing strongly printed whilst at other times subtle like an animal pelt, as with this one. I also included a resist during the laying out phase of this piece, while the finished hanging could be used as a table runner the channel at the top makes it really simple to hang! 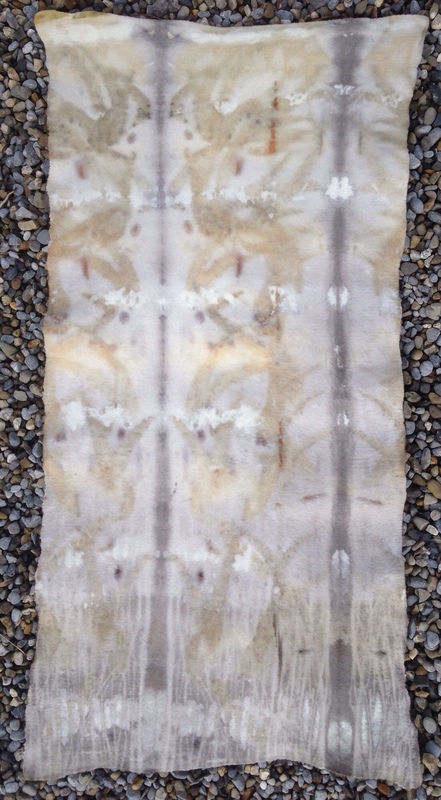 This entry was posted in Natural printing and dyeing, nuno felt, Showcase 2014 and tagged Felt, natural printing, nuno felt, nuno felt wrap, Showcase, silk scarves by Nicola. Bookmark the permalink.